Adorable pink ribbon lanyards. They are great for fundraising!! Use the lanyards to attach your badge for work or for your walk. Walkers- display your pink ribbon pin collection on the lanyard. You can also attach your keys on the keyring. Great for teachers and nurses! If ordering less than 12 lanyards, choose your color- white or pink with pink ribbon. When ordering more than 12 lanyards or by the dozen- please choose the option that says: pink and white,as you will receive a 12 pack of lanyards (6 white and 6 pink). **Please note- price is for one lanyard only! Please note- When ordering for fundraising or for a store, you are ordering the lanyards by the dozen, not individually. 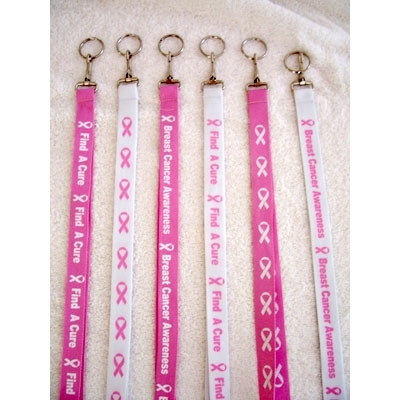 Assortment comes with 6 pink and 6 white lanyards with the ribbon and different sayings.